Stan Ames (G4OAV) gave a talk at the July meeting on the role of Amateur Radio in WW2. 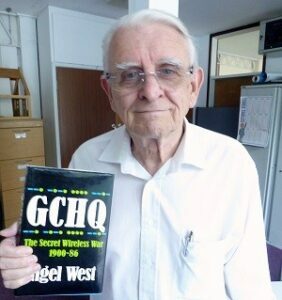 Stan explained, nothing public was known of radio intercepts and the role of Bletchley Park until an article appeared in May 1976, in the ‘Time Out’ magazine. The first time radio hams had even been involved was first announced in 1979 in the TV programme ‘Secret Listeners’ narrated by Rene Cutford. Radio amateurs were recruited as voluntary interceptors at the start of the war, becoming members of the Radio Security Service, which reported to the Secret Intelligence Service (MI6). Initially they were tasked with listening for German agents’ transmissions from the UK. Subsequently they were given the task of a general search of the airways to identify broadcasts from Germany and also monitoring given frequencies. Information was subsequently passed back to Bletchley Park. The Radio Amateurs were also involved in the direction finding of enemy transmissions.